According to Merriam-Webster’s Second Edition, a “schedule” is an outline of regularly occurring events and a “timetable” is the document in which the schedule is printed. In normal parlance and in this account, the terms "timetable" and "schedule" will be used as if synonymous. While this article is concerned with timetables issued for railway travel, timetables were issued by all other forms of transportation until made redundant by the computer era. The first and most important distinction is the division into either public or employees timetables. In the case of public timetables, a further separation is made to reflect different services offered by railway companies or differing audiences for the publication: System timetables; Condensed issues; Branch lines; Suburban forms; Name-train issues; and Brochures containing schedules. System Timetables. A system timetable shows the railroad's nearly complete passenger service, including a detailed station list and local trains, but usually does not include suburban operations. The very largest systems, notably the Pennsylvania, excluded regional operations from their “Form 1” system schedule in order to keep its size manageable. 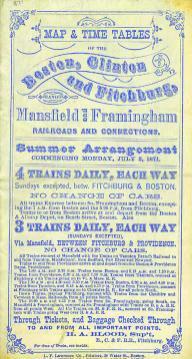 These issues form the core of virtually all collections of public railroad timetables. Condensed Timetables . These timetables were designed for the traveler interested in through travel to major points of importance. Such schedules were less costly to produce and less bulky, often distributed beyond the direct service area of the railway. Some, especially those issued by the Woodward & Tiernan publishing house of St. Louis, contained only schedules in one direction, on the theory that a new timetable would probably be in effect by the time the passenger returned. These are of much less interest to collectors than the system issues, even though some have attractive and colorful covers. Timetables issued in the 1870s were nearly all in this format. Branch Line and Suburban Timetables , showing complete service for a particular branch or branches. Many collectors include such issues in their collections. Most of such timetables have a form number which remains consistent from issue to issue. This category does not include individual station timetables used in suburban territory, often issued by an advertising contractor such as TDI. The Pennsylvania RR was a special case. They were the "Standard" railroad of American railroad and after the 1870s never issued anything close to a "system" timetable. Their many forms are usually only of interest to those afflicted with Asperger syndrome, but a summary is now available for those who dare to look! Name Train Timetables are a popular sub-category among collectors. The folder should contain a schedule of the featured train. These folders are often very ornate and the best contain diagrams of the individual cars in the train’s consist. Brochures including timetables. 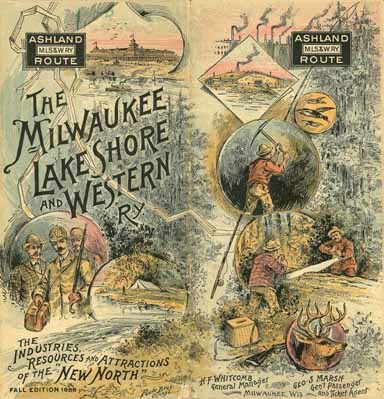 Many small roads whose claim to fame was scenery or some other geographical feature, issued a destination promotion brochure which included a schedule, almost as an afterthought. It may be the only publication of that road, and be ten percent schedule and ninety percent brochure. Most collectors regard these issues as “system” if they were the sole publication of the line. On a more local level, it was common practice in the 1900-1930 period for several electric interurban lines serving one area to cooperate on a single joint timetable, often with the sponsorship of a publisher and advertisers. In some cases where this practice was successful, the participating lines discontinued their individual publications. In some cases, the trade name, or “DBA”, covers a number of related railways with common ownership but different names, and those names are not always evident to the public. For example, in 1935 a Missouri Pacific Lines system timetable contained schedules for the Missouri Pacific RR, Gulf Coast Lines and the International-Great Northern RR. A collector should be aware of these permutations and settle on an internally consistent system of classification for a collection. The most valuable single naming resource is a reference entitled Railroad Names , privately published by the late William D. Edson. The NAOTC website continues to develop a more modest reference utility. Official Guides and Poor's Manuals are the best traditional reference books ordinarily available and familiar to collectors. For many names, it will be necessary to refer to older issues of the above publications, as railroad corporations undergo changes in name as do other corporations. A frequent variation is found where a railroad becomes a Railway instead of Railroad or vice versa as the result of a re-organization. (For example, the Philadelphia & Reading Railroad became the Philadelphia & Reading Railway .) The Seaboard Coast Line was the result of the merger of Seaboard Air Line and Atlantic Coast Line. Bear in mind that each such change results in a new entity for the collector to reach for in adding to his total of timetable issuing companies. Inception to Civil War (1830-1865). Timetables from the beginning of railroading in the 1830s up to the Civil War era are of great historical interest, depicting how railroad pioneers went about getting our early rail system in operation. Early railroads were typically short point-to-point lines. The timetables of this era generally took the form of newspaper advertisements and posters, known as “broadsides”. The newspaper notices often showed a woodcut of a railroad train and a condensed schedule of operations. They may be found in almost any newspaper of the time. The very first was placed by the Baltimore & Ohio Rail Road on May 20, 1830, in the Baltimore Patriot announcing the commencement of service over the first American railroad line beginning on May 24 (Note the "1820" date typo in the clipping.). While useful to the railway historian, they have typically been of little interest to collectors. The broadsides were first printed for use at stations and then adapted for distribution to hotels and other public places. As their distribution expanded, embellishments such as woodcuts of locomotives or trains were added. In the 1840s, some railroads began to distribute small cards to their customers shown the times of trains. Some lines also began to use a schedule printed on a single sheet which actually served as the authority to operate trains, giving a train in one direction specific superiority over another in the event of a meeting. These became known as “employees timetables” and continue to serve as basic operating authority documents on railways today. Consistent with the printing technology of the day, these and the larger broadsides were single sheet, one-sided affairs. "Written time-tables were in use until too many copies were required to stock the employees, and then printed ones came in. The public was kept informed of the movement of trains and the changes in time by handbills and announcements in New York newspapers and the two Goshen newspapers ... One of the original official timetables, made with a pen, would today be of priceless value as a relic of pioneer railroading, and a printed copy of one would be of scarcely less intrinsic worth as a curiosity in the history of railroad operating, but not one of either is in existence. The oldest handbills announcing changes in the running of trains on the Erie and giving information as to passenger rates and regulations, that the author has been able to find, were issued in the spring of 1847." As the Civil War approached, the railways began to experiment with timetable formats, usually in order to display more than a single line and a map of an expanding system. The early small cards evolved into folded sheets. Some broadsides were issued with maps printed on the reverse side, and then issued on lighter paper so they could be folded. But this early development would have to wait out the War before it could flourish. The War, of course, disrupted all civilian life and most particularly railway operations. Surviving documents related to timetables from the Civil War period itself are very scarce, most particularly from the Confederacy. After the Civil War, railway development on the America was aided by the establishment of a standard gage, permitting interchange of rolling stock, as well as the introduction of Standard Time in 1885, which permitted a long distance operations to be run as a coordinated entity. As small railways grew into systems and long distance travel became more customary, the need for a timetable to display more information soon exhausted the limitations of a single sheet of paper. During this period, distribution of timetables to other railway offices, stations and hotels became customary. To facilitate this distribution and the presentation of timetables from various companies in an organized fashion, printers settled on a standard dimension of four inches wide by nine inches tall for most timetables intended for the public. Whatever could be printed on a large sheet of paper would then be reduced by a series of complicated folds into a nominal 4x9 folder. Typically, one side of the sheet contained schedules and related information, while the reverse side displayed a large ornate map with the sponsoring railway shown as big and straight as the imagination would tolerate. The apogee was reached in 1887, when the Chicago & Alton, a rather small line between Chicago and St. Louis, issued a 33” x 24” sheet which reduced by a series of ten folds to a 54 panel 4x8 folder. Timetables of this “fold-out” style of timetable provided a large canvas for railroads to display detailed and ornamented maps. but they suffered from being cumbersome to use and quickly deteriorated at the folds. The solution to this physical dilemma came forward in the form of the mechanical stapler. which had been patented in the 1870s but was not adapted to commercial printing until 1889. (Stapler history) Multiple page booklets of uniform size could now be cheaply and quickly produced in large quantity, which had not been possible with earlier techniques of gluing or sewing. During the last decade of the Nineteenth Century, the large fold-out format gave way to the style which has generally prevailed ever since, the “Timetable” format. This consists of 16x9 collated sheets, folded and stapled along the center into a 8x9 booklet, and then folded again into a 4x9 dimension to fit an envelope or standardized display rack for stations and hotels. In this format, information was easier to locate, the refolding and wear and tear at the folds was eliminated. The big disadvantage was that maps were now restricted to the 16x9 “centerfold” at best. In December, 1917, America’s rail system was suffering from massive congestion resulting from the War buildup. The Government of the United States under President Wilson seized control of the Nation's railroads from their owners and placed them all under the control of the United States Railroad Administration. William G. McAdoo, Secretary of the Treasury, took on the additional position of Director General of the USRA. The period of control began December 28, 1917 and lasted until March 1, 1920, a period of approximately twenty-six months. Only the most marginal small steam railways and electric interurban lines were excluded from the takeover. The story of American’s first experiment with large scale socialism is best left for others to tell, except for the dramatic effect that the seizure had on the issuance of America’s railway schedules..
Timetables issued by USRA bore the heading on the front panel: “UNITED STATES RAILROAD ADMINISTRATION, W.G. McAdoo, Director General of Railroads” (or his successor, Walker D. Hines), and included a quaint admonition to “Avoid Waste – Keep this Timetable” In some cases. the USRA continued to permit a logo on the cover in black-and-white. All type fonts and “boiler-plate” travel information used in all the issues were identical, to enforce the image of unity. Although the private companies had been named variously Railroad, Railway or Rail Road, under the USRA they all became “Railroads”. The printing of timetables was contracted out to government bidders who were not necessarily the same vendors used by the railways. When the War ended the railroads were returned to their owners. The effect of the USRA takeover had been to destroy the traditional relationship between each railroad and its printing vendor, so timetable production generally continued in the new USRA model for a time before starting to show the color and sparkle of competitive differentiation. But as each company finally returned to issues of a more individual design, a new level of consistency from issue to issue was followed, resulting in less visual variety than had existed before the War. Some railways, notably the Lehigh Valley, Atlantic Coast Line and L&N, resumed cover designs used since the turn of the Century and continued their use until the end of passenger service. Another reason for uniformity during this period is that the Interstate Commerce Commission essentially froze the competitive framework of the industry, allowing virtually no realignments or mergers from 1920 to 1964, when the Norfolk & Western was allowed to acquire the Wabash and the Nickel Plate. This period marked the beginning of the decline of railway passenger service in America. Passenger traffic reached a peak in 1920 and only briefly surpassed that during the Second World War. Local trains and branch services were early victims of automobile competition, many only continuing because of mail contracts and regulatory obligations. Long distance services continued to flourish into the boom of the late 1920s, and were propped up after the depression and World War II by the introduction of cleaner diesel locomotives, air-conditioning and streamlined design. But by 1958 the end came more clearly into view as the Interstate Highway System was completed and airlines introduced jet-powered aircraft. The last straw was the decision of the U.S. Post Office to remove mail from the trains in 1967. Mail revenue had not only provided the last dependable stream of revenue for many passenger operations, it also provided a rationale for regulatory agencies to force the continuance of money-losing trains in the name of “public service”. Most railways also faced declining freight revenues during this period, so a “perfect storm” was in the making. As railroads began to trim passenger operations with greater success, the size of the timetables they issued shrank accordingly. Additional shrinkage resulted from the diminishing interest in using the timetable as a promotional vehicle. Companies which had once put out a monthly issue cut back to seasonal, then to twice annually at Daylight Time change. In fact, some railways, notably the Missouri Pacific and the Chicago & Eastern Illinois, printed only as often as needed to escape regulatory criticism. Systems which had issued thick timetables with 36 to 84 pages (72 to 168 4x9 panels) reduced their publications to as little as 4-page leaflets or even single 4x9 cards. The publications became far more spartan in design and quality as well. The beginning of the railroad merger movement on the 1960s provided a flicker of interest in this otherwise bleak landscape. The creation of the Erie-Lackawanna, Burlington Northern, the new Norfolk & Western and Penn Central led to interesting rearrangements of some passenger services and the timetables that described them. Finally, when the patient was writhing in the pain of terminal illness, Congress administered euthanasia by creating the National Railroad Passenger Corporation (NRPC), known as Amtrak. Railways were given the option of delivering their passenger services to Amtrak or continuing on their own. Only three chose to continue their own operations (Southern, Rock Island and Rio Grande). Aside from those three, the last American railway intercity timetables were issued in early 1971. The Federal Government took over American intercity passenger operations from the railways on May 1, 1971. The first Amtrak timetables were exceedingly unattractive publications. Amtrak chose the National Railway Publication Co. as their printer. This hoary old outfit had printed the Official Guide for over 100 years and their printing technology remained firmly rooted in the 1800s. Despite serving as the repository of rail schedules for over a century, they had no past experience with individual railroad timetables at all. Of course, the market for their flagship publication had just been demolished. During the ensuing decades, AMTRAK would go through a variety of ways to present their evolving operation to the public, a complicated subject best left to another article. The three holdouts (Southern, Rock Island and Rio Grande) reduced their issues to double-sided cards until their services ended (in 1979, 1978 and 1983 respectively). During the same period, American railways operating suburban commuter services turned over nearly all of them to transit operating authorities who continue to issue schedules of their own. After the demise of individual railway timetables, issuance by bus lines and airlines continued unabated. But the advent of travel agency computers and personal access to the internet triggered the final cycles of retrenchment. Other factors at play were the demise of old fashioned folder distribution companies that used to stock timetable racks at hotels, and airline deregulation which allowed all airlines to fly anywhere to anywhere, making a map somewhat redundant. In 1985, Republic Airlines decided that its bulky (and expensive) system timetable was being used by a few very loyal "Frequent Flyers", as well as lots of flight personnel. It began to issue a so-called "Employees Timetable" with basic schedules and city codes instead of full airport names. The designation "Employees Timetable" was only meant to diffuse criticism by members of the travelling public that found it hard to use, for it was readily available at airport counters. The savings were huge, there was little negative feedback. The "Employee" designation was dropped, but the concept endured and was subsequently adopted by Northwest after that carrier absorbed Republic in 1986. A Northwest official who moved over to United in 1987 tried to implement the same cost saving, but vociferous United employee reaction blocked the move. Nevertheless, many airlines and bus lines began to issue timetables less frequently so that they only stood for "an example" of service. The last significant holdout, strangely, was Southwest Airlines, who discontinued their system timetable on June 28, 2009. Think how low their fares would have been had they acted twenty years earlier! 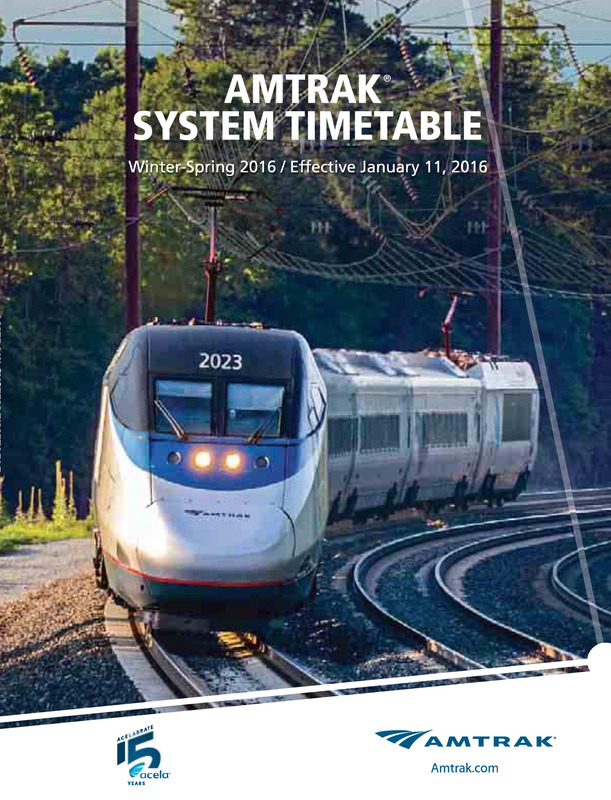 On 11 January 2016, Amtrak issued their last printed system timetable. Issues thereafter would be available only in downloadable PDF files.